Nov. 18, 2011, 10:30 a.m.
Plus: Journalists arrested at Occupy Wall Street, more fallout over Romenesko and attribution, Amazon’s Kindle Fire release, and the rest of the week’s future-of-news reads. By Mark Coddington @markcoddington Nov. 18, 2011, 10:30 a.m.
A fight for online freedom: A U.S. House committee hearing brought an important three-week old bill on Internet censorship to the spotlight this week. The Stop Online Piracy Act (a companion of the Senate’s Protect IP Act), would allow content creators to shut down websites on which people hosted unauthorized copyrighted content, or linked to sites that did. The Atlantic has a good, quick explainer, and the advocacy group Fight for the Future has a sharp video illustrating its implications. If you want to go in-depth, Techdirt has the most thorough continuing coverage of the bill. I’m only slightly exaggerating when I say that it seems as though pretty much everyone on the Internet hates this bill. Bunches of Internet giants oppose it—Google was a major testifier at this week’s hearing (though its rep referenced the WikiLeaks payment blocks favorably, which concerned some)—Tumblr ran an online campaign against the bill by mock-censoring its users’ dashboard screens, and loads of online commentators howled against it. As GigaOM’s Mathew Ingram noted, you can’t have the explosion of creative production, individual empowerment, and democratic potential of the Internet without the downsides of rampant copyright infringement. If you take away the latter, he argued, you take away the former, too. And venture capitalist Brad Burnham made the interesting point that the architecture of the web is based on the assumption that there are more good actors out there than bad, an idea that this bill runs squarely against. This bill poses some potential problems for journalism, too. Jessica Roy of 10,000 Words outlined some of those issues, pointing out that articles could be censored for linking to sites with piracy information, and that citizen journalism and innovation could be stifled. GigaOM’s Mathew Ingram was particularly troubled by how little news orgs and their journalists asked readers for news tips and feedback, and media consultant Terry Heaton said this Twitter-as-headline-feed pattern among news orgs is evidence that it really is all about the money. “If influencing public life is the goal, then readership is what matters, and there are many ways to efficiently deliver unbundled content via the Web,” he wrote. “When forcing people to read our content within our infrastructure, then it’s clear that monetizing that content is more important than anything else.” Amy Gahran of the Knight Digital Media Center, meanwhile, tied the study to another Pew study that reinforced the value of personal recommendations over impersonal ones. There was also quite a bit of talk on Twitter about the study’s weaknesses, led largely by media scholars like USC’s Robert Hernandez. Still, one j-prof, Alfred Hermida of the University of British Columbia, pointed out that this report’s findings do echo those of several previous studies, both academic and professional. 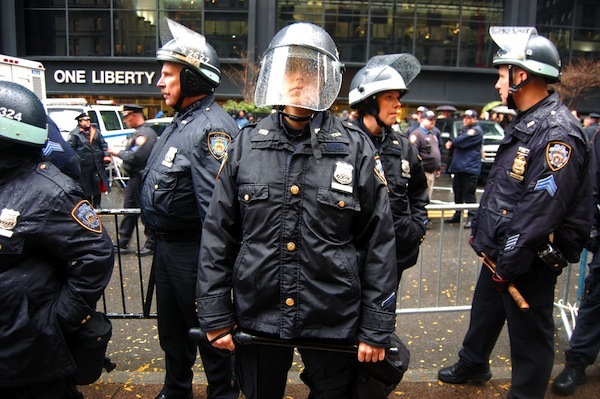 Occupy Wall Street and scooping the wire: New York police swooped in earlier this week to clear Zuccotti Park of Occupy Wall Street protesters, which in itself wasn’t surprising: Similar sweeps have been done in numerous American cities. What drew particular attention among future-of-news folks was the way police did it — by blocking journalists from viewing the action in New York and even arresting 26 of them nationwide, of whom seven worked full-time for traditional news orgs and seven (in New York) had NYPD press credentials. The New York Times and The Atlantic have the most thorough accounts of what went on, and you can check out video of one of the reporter arrests at the Times’ The Local. Elsewhere in Occupy-related media and tech ideas: The Atlantic’s Alexis Madrigal kicked off a series of posts on technology’s role in the Occupy protests with a creative description of Occupy as a type of API, ReadWriteWeb’s Jon Mitchell praised Storify for its role in Occupy coverage, and New York Times freelancer Natasha Lennard explained why she’s ditching the objectivity-based paradigm of the mainstream media to get involved with Occupy. Other media critics continued to defend Romenesko (Reuters’ Jack Shafer) and rip Poynter (Terry Heaton, Felix Salmon). The Gender Report’s Jasmine Linabary, meanwhile, wondered why we weren’t seeing much attention paid to women commenting on the Romenesko story. A few other notes regarding the Fire: Time Inc. had five of its magazines on the Fire at its launch after some protracted negotiating, and Amazon has made the Fire’s source code available to developers to encourage software experimentation. Wired’s Steven Levy, meanwhile, had an in-depth discussion with Amazon’s Jeff Bezos about the state of the company. — A federal judge ruled late last week that Twitter has to hand over information about possible WikiLeaks supporters, one of whom, Icelandic member of Parliament Birgitta Jonsdottir, expressed her outrage in the Guardian over the decision’s threat to civil rights. ReadWriteWeb’s John Paul Titlow and GigaOM’s Mathew Ingram were also among those concerned about the future of privacy online. — A few advertising-related tidbits: Reuters’ Felix Salmon summarized a fascinating talk he gave on the woeful state of online advertising and what to do about it, Wired looked at Twitter’s efforts to make serendipity pay as an advertising model, and the Lab examined newspapers’ advertising efforts on Twitter. Meanwhile, The New York Times ran an innovative cross-platform interactive ad that also mimicked its news content, which led ACES’ Charles Apple and the Columbia Journalism Review’s Clint Hendler to question its ethics. The Times told Hendler the ad couldn’t realistically be confused with actual Times content. — The Columbia Journalism Review explored a crucial issue in the changing news ecosystem — what happens to all the communities that aren’t hubs for innovation? — with a series of pieces on Modesto, California. — Also in CJR, the Lab’s Megan Garber wrote a fascinating article looking back at how journalism has viewed its future over the years. The University of Colorado’s Steve Outing decided to add to that tradition of journalistic fortune-telling with his set of predictions about what online news will look like 20 years from now. Twitter bird by Matt Hamm and Occupy Wall Street photo by bogieharmond used under a Creative Commons license. POSTED Nov. 18, 2011, 10:30 a.m.
Coddington, Mark. "This Week in Review: An Internet censorship threat, and news orgs’ one-way Twitter use." Nieman Journalism Lab. Nieman Foundation for Journalism at Harvard, 18 Nov. 2011. Web. 23 Apr. 2019. Coddington, Mark. "This Week in Review: An Internet censorship threat, and news orgs’ one-way Twitter use." Nieman Journalism Lab. Last modified November 18, 2011. Accessed April 23, 2019. https://www.niemanlab.org/2011/11/this-week-in-review-an-internet-censorship-threat-and-news-orgs-one-way-twitter-use/.